It’s really good to get familiar with pastry, as it opens up many possibilities within savoury and sweet, and there really is no limit to what you can put in a pie. After expressing this perspective to my friend Olivia, she requested I make her a lasagne pie, which I did! Some of my specific pie types will appear on the blog at a later date, for demonstration purposes I am making my first, and most well known pie among friends: the curry pie. I first got in to pies a few summers ago, and found myself some small tins around £3-4 each that were a size suitable to be able to provide each dinner guest with an individual pie each. When first making individual curry pies, I discovered how economical they were, both with time and cost; one serving of curry was enough to fill two pies, and several pies take little longer than making just one. Very soon I was making three at a time – two for the freezer and one for the plate. 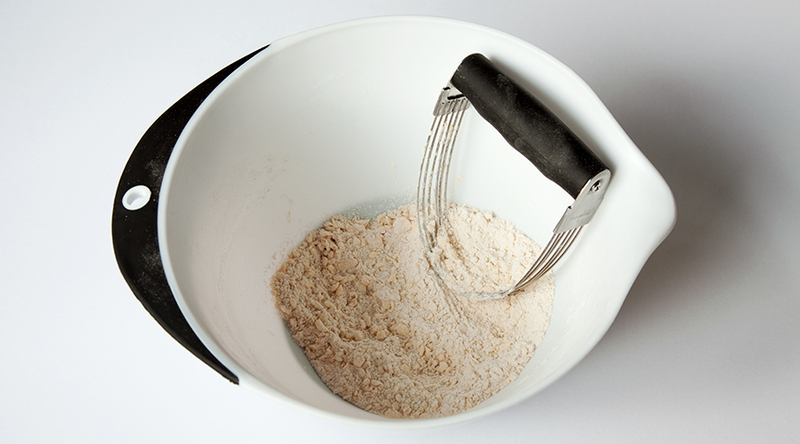 Get a pastry blender! My mum bought mine to help me get in to baking, it’s one of the best things she’s given me. First, put a small glass of cold water in the fridge, or add an ice cube. 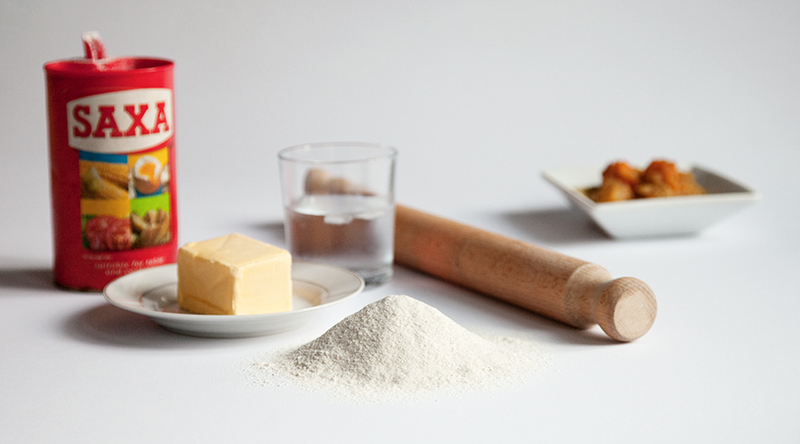 Measure the flour and add a pinch of salt, then measure and dice the butter. Add the cubes a few at a time and kick them about in the flour to stop them sticking together. Then get in there with the pastry blender before adding and mixing the cold water. Don’t overly blend the dough as the pieces of butter within the mixture result in a crispier finish once cooked. For this reason it’s also important to keep the pastry cold (so that the butter retains its form), so it’s best to make the pastry first (and quickly), then store it in the fridge while you prepare your filling. Some more complex pastries require frequent back and forth travel between the fridge and the board. Trickle small amounts of water a bit at a time while you roughly mix together the bowl contents with a knife; the coarse mixture should not reach the point that it’s actually sticking to the bowl, only enough that you can just about collect up the last little bits with the main dough ball. For individual sized pies, about a quarter of the dough is needed for the top, for wide shallow pies, around a third. Form the pastry in to a cylinder and divide as necessary. When storing it you will need to keep it wrapped, one of many circumstances in life that zip-lock freezer bags come in use, so I recommend getting some. If you fail to keep the pastry cool, blend it too finely or use your fingers, you will still end up with pastry! It just won’t be as good. 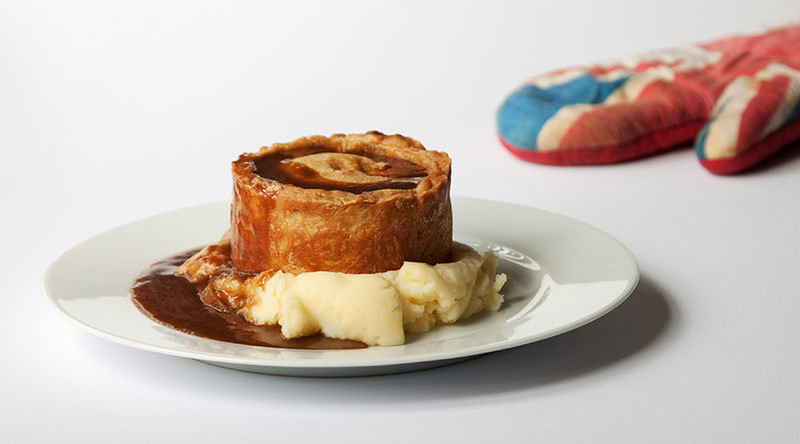 If you are making a shallow pie, you can simply roll out the pastry, drape it over the tin and push it in to place. If you are making a fairly narrow and deep pie like the individual pies I make, you’ll need an object the same shape as the tin but slightly narrower, to shape your pastry around before you transfer it to the tin. I swiped an old jar from my mum that fits perfectly. 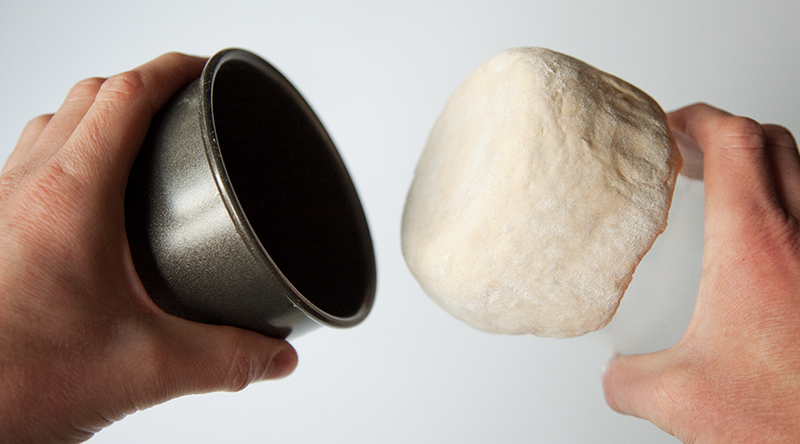 Roll out your pastry evenly in to a circle, make sure the surface that will drape over the object is well dusted with flour, then lift the pastry on to the object and shape around it. Quickly lift both the object and tin on to their sides and slot the object in to the tin. Place the tin on its base, and slide the object back out, leaving the pastry in the tin. 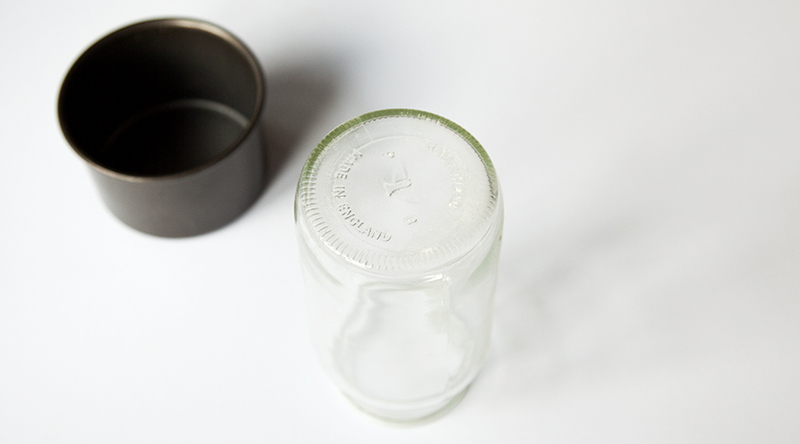 Place your filling inside (resist over-filling) and paint the rim with milk before quickly rolling out the lid and fixing in place with your fingers. Pierce a hole in the top then put the pie straight in the oven at 220 degrees before turning down to 200 after 15 minutes. This entry was tagged Bake, Baking, Butter, Dough, Flour, Pastry, Pie, Pie pastry, Pies, Salt, Savoury, Shortcrust, Shortcrust pastry, Shortcrust pie pastry, Sweet, Water. Bookmark the permalink.